Since its initial creative pitch in 2010 until weeks before its launch, Horizon Zero Dawn has inspired awe in those that see it. We’ve spent more than a decade building the Killzone franchise, and now Horizon Zero Dawn marks an entirely new journey for us. In our multi-part Horizon Zero Dawn behind-the-scenes profile, key members of our team touched on the challenges they overcame in creating their first action RPG. The first video speaks to how Guerrilla switched gears from creating first-person shooters to an action RPG. The second talks about shaping the studio to create an experience that heavily relies on narrative. The third and final video will look at Aloy, the game’s star, and speak to how quickly she has enthralled gamers across the world. Guerrilla Games co-founder and Managing Director Hermen Hulst has called Horizon Zero Dawn “the single most ambitious project that Guerrilla Games has ever taken on.” He is, of course, speaking in part to the challenge of transitioning an accomplished studio from one genre to another — one with new elements that the designers had less familiarity with. 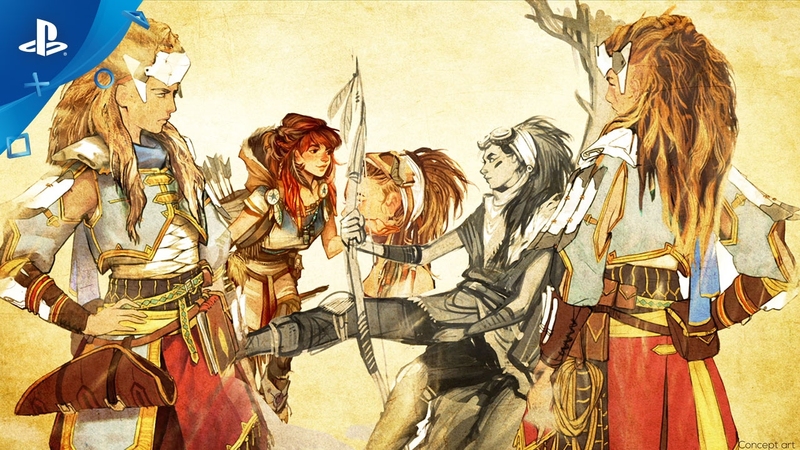 Ever since that first internal pitch in 2010, the star of Horizon Zero Dawn was Aloy. We never questioned this, but designing her still proved a long and difficult process. Her character went through many iterations before the team settled on the figure you see in-game. There was so much about Aloy that the team felt vitally important they get right. How she sees the world, how she interacts with other characters, and her deep relationship with Rost and how he helps her contend with being a tribal outcast. Watch our behind the scenes video above, and get ready: Horizon Zero Dawn launches February 28 on PS4. Can’t wait to play it thanks Guerrilla Games for making something truly original so beautiful. what you said and more, as an older game player this is awesome to see how the new and better tech makes the developers look for more and new ways to get these really big worlds and just give you that WOW factor. My first game I ever played was Pong and I was like wow what can they do now and let me tell you I have seen some amazing games come out over the decades and now even after 42years of playing games I still have my love of playing games that I enjoy and this comes out the month I turn 60 and I will still be playing games for many more years I hope. One of the cool things about gaming Uglyman is that if you’re playing new experiences you haven’t really done before it helps prevent mental disorders where the brain function deteriorates. Playing Killzone for the first time until it starts to feel natural can help, playing Rock Band Guitar can help, playing Rockband Bass can help, playing Spiderman can help, playing Horizon Zero Dawn can help, playing Call of Duty every year doesn’t help… well ok… they didn’t help until the last 2 or so where things got really changed up. I hesitate to even say it might be possible that Overwatch Tracer can help, and maybe Overwatch Mercy can help. I don’t know if the science has dug in that deep, but I think just changing roles in a game to something that is very different even has a substantial effect because it’s all about creating new neurons and neuropathways to prevent degradation of older connections. So ironically playing video games can help you form a lasting mental state, which will in turn help you play more video games, which will in turn allow you to continue to stretch out your mind’s neurological health. Just remember to use your muscles because the older you get, the more you need to work them out to keep spry. Did you guys receive the update yet. i got the limited edition ordered. I cant wait. This IP is going to be huge. I honestly feel like we’re looking at gaming’s next big IP. I agree and I hope so too. As long as there’s no truly game-breaking bugs or massive glitches at launch, I expect this to be one of the biggest and best games of the year. My PS4 Pro is ready! I’m glad studio like Guerilla is evolving to projects like Horizon, this is so refreshing to see. I enjoyed the entire Killzone franchise, but Horizon looks like it will blow all of those games out of the water. Truly next-level, next-gen, game-changing concept. This looks like the next Skyrim I will be lost in for months to come. Accept this will have freaking awesome combat!!! Yes and thank you. Arghhh…. I want to love this game, but I just can’t. I’m sure I’ll die in flames for saying this, but I just cant play a game as a chic. I know, I know…. I’m one of those brutish, neanderthal male types that’s a chauvinistic pig. I just cant do it. I really hope I’m a minority in this and I hope this game does great. It really does look awesome. It’s a shame you feel that way, but everyone is entitled to their own opinion. I can’t wait to have a strong female character in a massive game, who doesn’t run around in a bra and lingerie. Sexism in games is so tiring and overdone by now. I’m sure my wife and daughter would agree. Looking forward to playing a female lead in a game that my wife won’t mind watching me play. How much have you tried getting yourself out of your comfort zone? You can’t be that bad of a person if you feel bad about it. There’s a lot of people who make fun of characters that play females. I’ve gotten people wondering why I play Talim in Soul Calibur. Though I can also enjoy Kilik and some others, but the characters I played the most in Soul Calibur (other than Nightmare) were characters that were highly movement oriented. A couple hits, flank the side, a few more hits, flip over the enemy, back off, let them charge, counter, dodge, combo again. Those kinds of hit and run tactics were a lot of fun for me. I think it would benefit you greatly to go to a midnight release for this game if you can. You don’t have to buy it, but if it’s being released at midnight maybe seeing a bunch of men waiting in line to play a game as a female would benefit you? Who knows maybe you’ll be able to enjoy Tomb Raider if you’re able to fight through this battle. Like ND with Uncharted and The Last of Us it would be great to see GG make Horizon a franchise and also develop Killzone 4! So excited for Horizon! Cannot believe we are less than a month away from release. Congrasts GG! Very much looking forward to this game. I see some game-play elements that are reminiscent of the Far Cry series, in a good way. I spent hours combing the lush environment of Far Cry looking for upgrades and such. I am going to do the same in Horizon. Start the Hype Train WOOP WOOP!!!! If you’re going to make fun of terrible side quests you might as well go the the masters over at Square Enix that made FFXV. Can we customize Aloy’s appearance like hair and outfit, colors etc? I know she has different outfits. They give stats, I believe. I doubt you can change the hair. I could be wrong, but the outfits are probably pre-designed. I haven’t been this excited for a new IP in a very long time. This game looks so amazing. It’s been on my “most anticipated” list since I saw it at E3 2015. So excited to finally play it at the end of the month. I’m gonna put so much time in this game. I love the lore. How it’s futuristic, but primitive at the same time. We’re the Old Ones. I love stories like that. The post-post-apocalyptic setting reminds me of the TV series “The 100” a bit. And robot dinosaurs? Oh, hell yeah, count me in! @ thesamuraiman_PS – Took the words outta ma mouth…minus the TV series part lol.